Although the idea of mystery is quite profound the speculation of the disappearance of Malaysia Airlines Flight 370 is oddly disturbing. 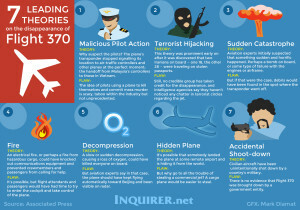 From NPR’s, “Malaysia Airlines Flight 370: More Debris And Confusion Over Findings,” comes a factual article based on missing debris findings from Flight 370. The article essentially delivers the findings in a purely news based fashion. The article informs its readers that seat cushions and windowpanes were found washed up on Reunion Island where a wing fragment was also recently found. 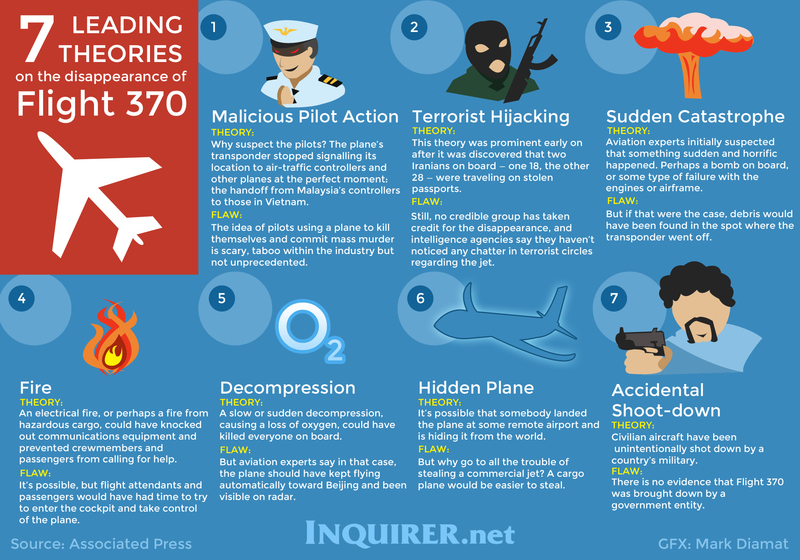 The author does add some speculation to the findings by adding that authorities are not 100% certain that the findings are from Flight 370. The author of the article didn’t have to do much to catch my attention because of the topic’s circumstances. Yet, the author presented the newly found evidence in an easy and understandable way. This entry was posted in Uncategorized on August 7, 2015 by Eryn Petrakis. 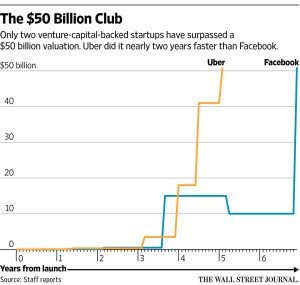 From the WSJ article “Uber Valued at More Than $50 Billion” comes an informative inside look at Uber’s record-breaking value. 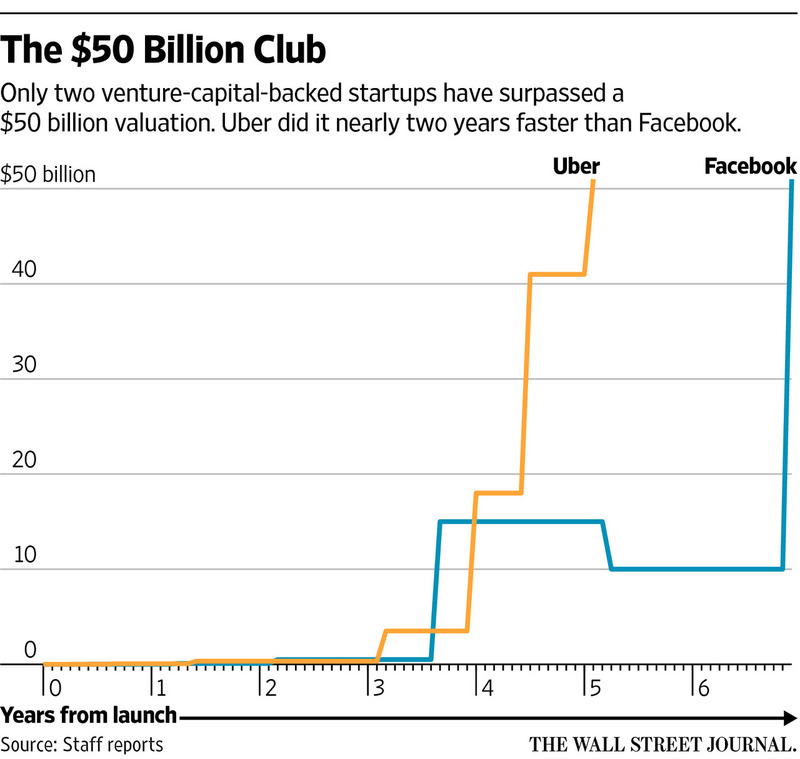 The article first grabbed my attention from its use of a comparison of Uber to Facebook. The article uses a graph to show the comparison between the two companies, and any reader can see that Uber gained its success around years 4 and 5 opposed to Facebook, which gained its success in year 7. The article also mentions that Facebook gained its success in the midst of a market correction, which lead to its small downturn in valuation around 2009. After this comparison, the article describes and gives insight to the investments and funding involved in the company of Uber. The article provides its readers with a clear understanding of how Uber invests and funds its money by using generic words and phrases that most knowledgeable people can understand. The article ends with an even more hopeful look at Uber’s addition of new technology and a potential plan for the company to go public. This entry was posted in Uncategorized on August 1, 2015 by Eryn Petrakis. From Jason Gay’s article “Why the USWNT Is Must-See,” published in the WSJ, he explains the USWNT’s important moments from the 2015 Women’s World Cup. 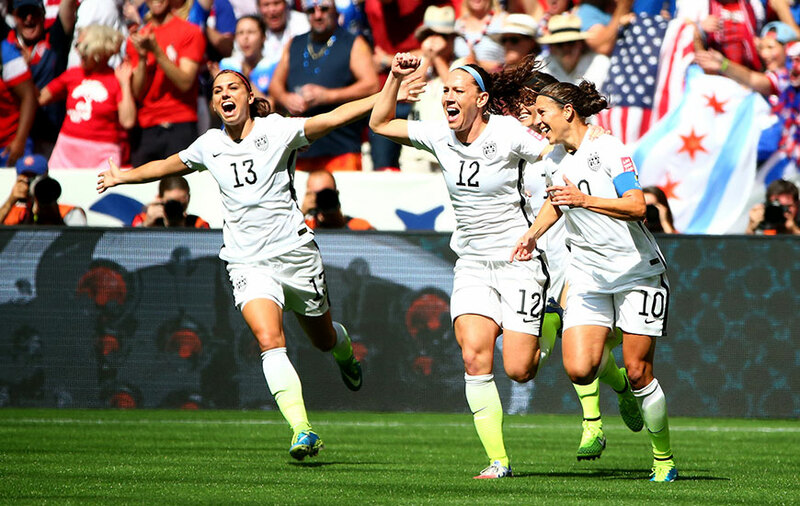 The article utilizes many statistics and is extremely positive and hopeful of the USWNT from its beginning to its end. Gay starts his article by mentioning other important upcoming sports happenings, which leads into his claim of the “world of sports moment” belonging to the USWNT. Gay plays up the USWNT’s successes by comparing it to the U.S. men’s soccer team’s participation in the 2014 Brazil Men’s World Cup. Gay then goes on to explain that despite changes in line up by the directions of a new coach, the USWNT still managed to win over their opponents and proceed to the following rounds. Gay also gives insight to the addition of new and younger players to the USWNT and its remaining abundance of veterans. This information offers his audience a clear understanding of the USWNT’s players’ loyalty and ability to stay in the game while still accepting new players to further the team’s winning capabilities and continue its lasting legacy. Gay’s use of statistics alone can convince anyone that the USWNT, with line up changes and an upcoming generation of talented players replacing veterans, is an incredible team that is definitely worth the watch. This entry was posted in Uncategorized on July 26, 2015 by Eryn Petrakis. Food—Whether it’s healthy or unhealthy the FDA is impartial. 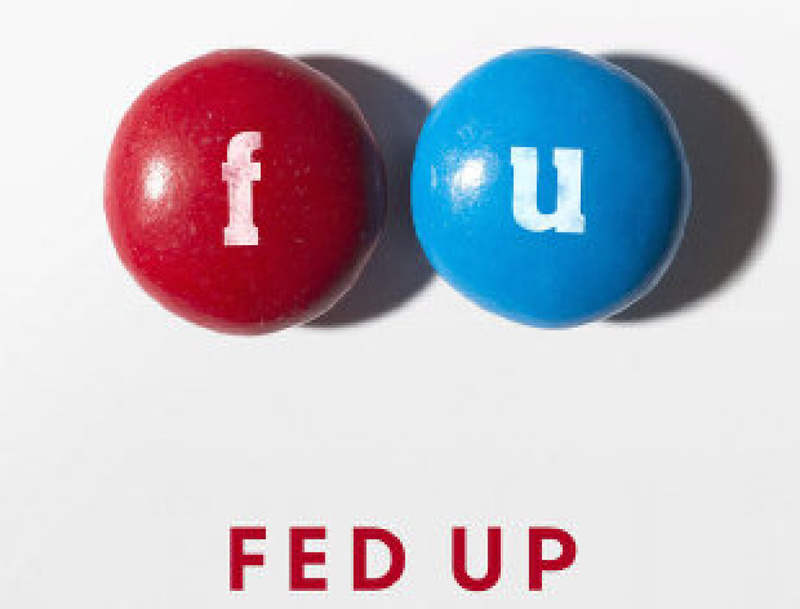 From the Netflix documentary Fed Up comes an eye-opening discovery of just how corrupt the government is when it comes to food. The documentary touches on the general nature of obesity and its growing numbers since the introduction of “fat-free” and “reduced fat” labeled products to the food industry. The documentary focuses on the FDA’s addition of sugar to these so-called healthier options and shows how the obesity rate of its consumers has skyrocketed. Laurie David who is the producer of the documentary and an Oscar winning producer of “An Inconvenient Truth,” uses Katie Couric to deliver the purpose of Fed Up to its intended audience. Along with the use of Katie Couric, Laurie David uses former FDA members to inform her audience of its corruption. Also among the masses of jam packed information incorporated into the documentary is stories of children struggling with obesity. This aids Laurie David in getting her audience emotionally invested before she adverts her audience’s attention to the relationship of food companies and the FDA. In this portion, the documentary features the food industry as a whole as having a “credibility problem” when it comes to being paid off and putting masses of chemicals into the foods that consumers eat. Throughout the documentary, Laurie David attracts and keeps her audience’s attention through scare tactics and hard facts without being too educationally boring or completely accusatory. This entry was posted in Uncategorized on July 19, 2015 by Eryn Petrakis. The genre of horror films is widely arrayed with each movie spinning every which way, with some being told as a “true story” and others being utterly fictionalized. As one of the more popular and specified as truly told stories, the film The Amityville Horror is one of the most speculated horrific happenings. 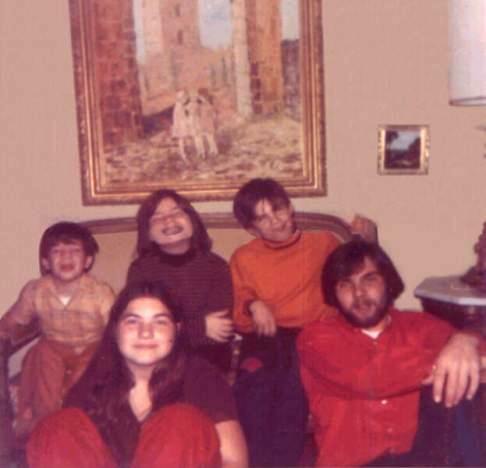 The film touches on the murders of the DeFeo family by their oldest son Ronald DeFeo Jr. The film centers on a supposed haunting of Ronald and the entire family inside of their house in Amityville. But the Netflix documentary The Real Story: The Amityville Horror tells the true horror of Amityville that occurred in 1974 without the faked aspect of a haunting. The documentary first catches its audience’s attention with the words “The Real Story” infused into its title and continues to carry a theme of truthfulness throughout its entirety. The producers of the documentary use credible critics to their advantage in convincing their audience of misleading information from previous films and books produced in favor of a haunting rather than murder. The critics also go on to explain Ronald’s troubled relationship with his father leading up to him murdering his family. This allows the audience to determine that a troubled past explains the murder of his family. Another aspect that the producers ingrained into the documentary was the overall aspect of its audience as being previously lied to and lead astray. Although the producers end the documentary with speculation of the DeFeo’s family murders, they were successful in convincing their audience that it was indeed murder and not an acclaimed haunting. This entry was posted in Uncategorized on July 12, 2015 by Eryn Petrakis. Every year the human population is filled with a multitude of media frenzies, but one of the most reoccurring and summer favorites is Shark Week. From Neda Ulaby’s radio byte, “After Sketchy Science, Shark Week Promises To Turn Over A New Fin,” she discusses how, in the past few years, the Discovery Channel has portrayed sharks in a menacing and somewhat unrealistic way. She plays on the emotions of her audience and uses logical reasoning to persuade and inform her audience toward a new science involved Shark Week. 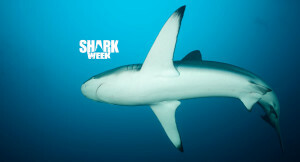 Ulaby starts her persuasion by explaining the Discovery Channel’s logic of Shark Week, which, similar to any media frenzy, is to gain millions of ratings. This statement of reminder allows her audience to feel tricked by the Discovery Channel, which helps her later in her argument. Ulaby then mentions the turnaround interview of a marine biologist, Jonathan Davis, and how those at the Discovery Channel misguided him. By stating a claim by a credible marine biologist, her audience can believe each claim she makes more and more. Ulaby also goes further on to name more credible marine biologists and how they say Shark Week began to be corrupted by essentially demonizing sharks through horrific tales of shark attacks. Although Ulaby was set to invoke the realization of the Discovery Channel’s deception to her audience, she ends her article with its reassurance. Ulaby confidently informs her audience that the Discovery Channel’s head of development and production recently changed and promises not to produce any more fake documentaries. This entry was posted in Uncategorized on July 7, 2015 by Eryn Petrakis. gvl5144 on Found or Missing? Nicholas Ciatto on Found or Missing? Zach Robinson on Found or Missing? Jess Madden on Found or Missing?